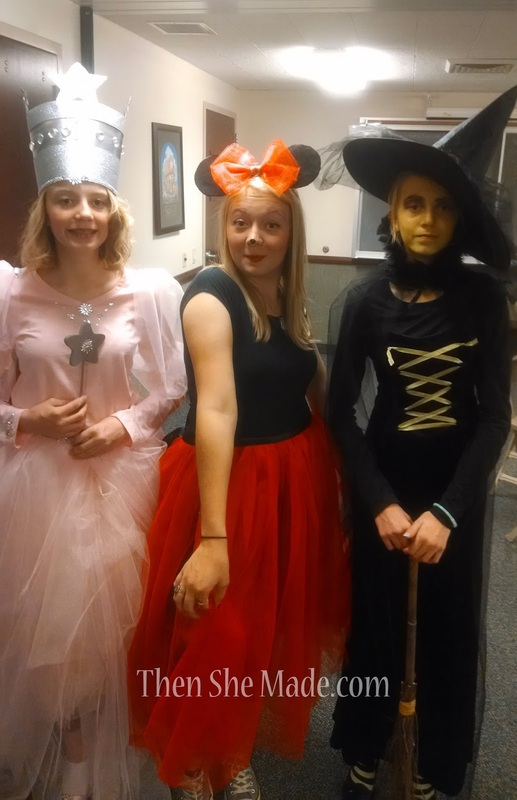 It is less than a week before Halloween and my girls are without costumes. Now before you panic for me, it's ok! They are getting older and aren't quite as into Halloween as they were in years past. However, that doesn't mean that I don't have to come up with something quick as they do have a party to go. This happened last year too and we were just fine. I've learned something over the years that always helps. Here what I've leared: T-shirts + Tulle = fast, inexpensive costumes. Don't believe me? 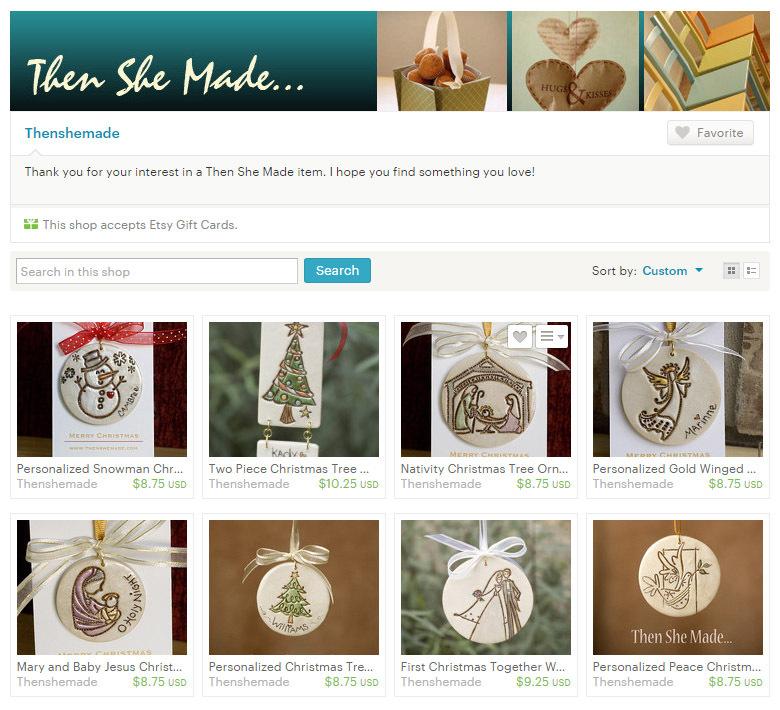 Here are three examples from last year that we pulled together really fast. 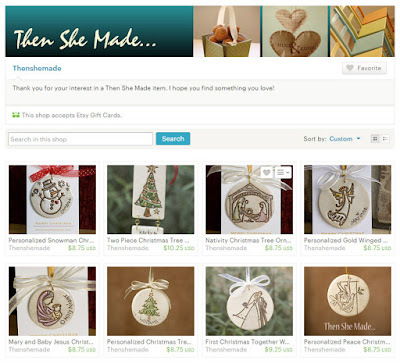 And, my apologies for the crappy photos. I forgot to take pictures until we were at the church for the party and all I had was my phone. 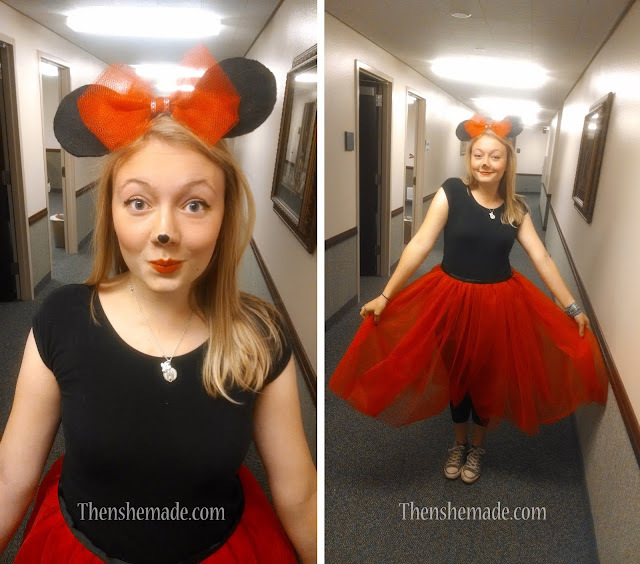 Miss M as Minnie Mouse: Black t'shirt with red tulle skirt. I can't really take credit for this as she made her own costume. But, I helped a little. She took her tulle, about 6 yards - it was $0.78 cents a yard, and left it folded in half like it comes from the fabric store. On the fold she ran a super quick hand stitch across the full length and then pulled the thread to make it gather. From there she took a 3 inch black ribbon, folded it in half and placed it over the fold of the tulle and sewed it in place. She left extra ribbon in the back to tie the skirt on and create a bow. (sorry, no photos of that). She paired the skirt, which took about 30 minutes to make with a black t'shirt, leggings (the tulle is see-thru) and mouse ears which she made by attaching felt circles to a head band. And, she used left over tulle to add a bow. 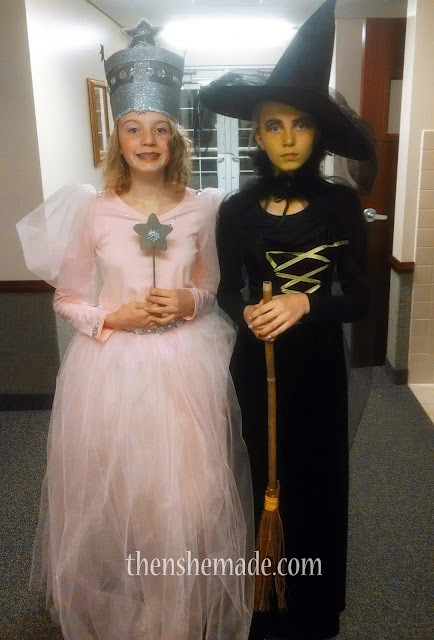 Bug and Jet as Glinda and the Wicked Witch of the West. They chose these costumes on their own. Which, since they are twins, I found it really funny. 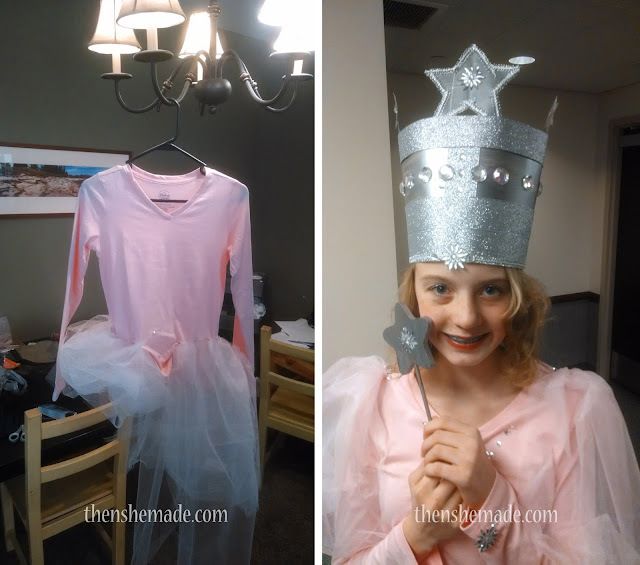 Glinda: To make Jet's costume I grabbed a cheap pink t'shirt from Walmart $3.33, some pink tulle, fake glue-on gems, silver ribbon and poster board. I started with the t'shirt and tulle. I gathered the tulle and I sewed it right onto the t'shirt. It fell at a weird place when added to the bottom hem of the shirt so instead I added it up from the bottom by about 4 inches. This made the skirt start at her waist instead of her hip. The first layer I sewed right on to the shirt, this gave it volume. Then I added a second layer by making a skirt just like Miss M's above only I unfolded the tulle so the skirt was full length and hit the floor. After it was all put together, I had Jet put it on and I trimmed the bottom so she wasn't tripping on excess tulle. I then took the tulle I had trimmed off and attached it to the shoulders of the t'shirt to make puffy sleeves. Once that was added I just glued on the fake gems to add some sparkle and interest. And lastly, I made the hat from poster board, painted it silver, added on some silver ribbon and fake gems and that's it - done! 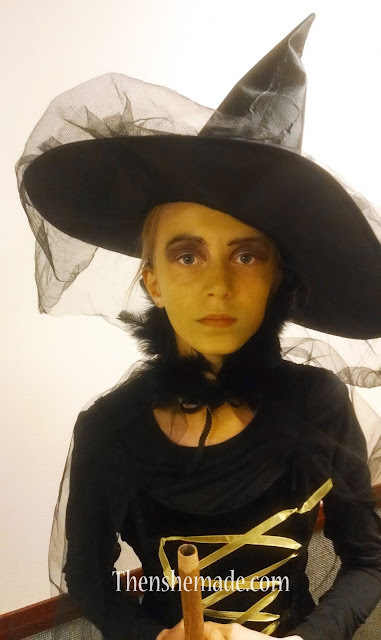 Elphaba/the Wicked Witch of the West: For Bug's dashing look we already had a lot of the pieces. They just needed to be dressed up a bit. We had the dress and hat. So, we added a black t'shirt underneath and that was that. Really truly, she could have been done there by just adding a hat. However, she looked a little blah. Here's where the tulle comes in. Using black tulle, I made her a black tulle cape - sorry, it's a little hard to see in the photo. What I did is gathered one end of the tulle together by doing a quick stitch and then pulled the thread to gather it. On that same end, I sewed on black feathers and a ribbon on each end so the cape could be tied around her neck. It looked a whole lot more witchy that way. Is witchy a word? Then I took a $3 Target Spot witches hat and added some tulle for interest. Add in a little green face paint, some stripped socks, and a broom and this kid was all set. It all worked about fabulously! And on the cheap, too! Also, my previous post I shared my spiders but never showed you where I put them. I'm not going to share a photo of the whole house but here's a small snippet of what I did. You can't see it, but my whole porch and unseen railing are currently covered in spider web and spiders. There are 40 or so spiders of different sizes crawling all over the place. 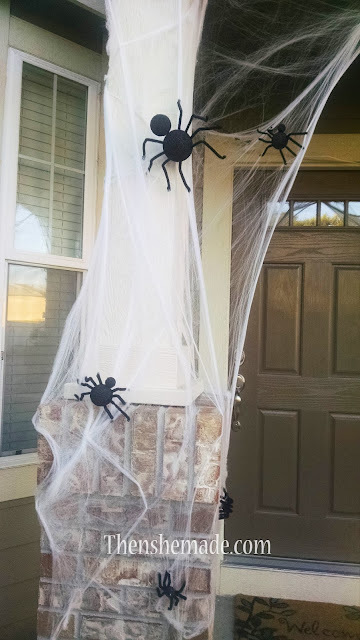 I also have my "beware of Spiders" sign hanging by my door - so fun! Happy Halloween to you all! I'm off to figure out how to make this years costumes. Wish me luck! At our The Best Five Packers and movers Chandigarh office you will get different movers packages under which you can choose different options according to your budget and choice. The options we offer to add on tasks in the process are cost estimation of movers in Chandigarh.